TAICHUNG. 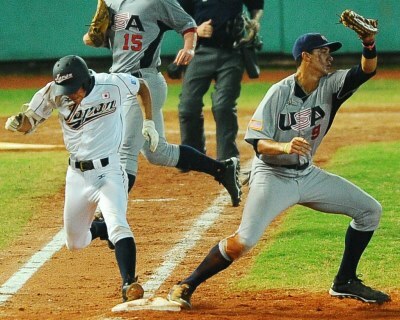 The XXVI 18U Baseball World Cup in Taichung will end on Sunday with three games, highlighted by the Gold Medal Game at 6pm between defending champion USA and Japan at Intercontinental Stadium. Both teams met at the end of the semi-final round robin on Saturday evening with the Americans winning the finals preview to take care of home field advantage. Obviously not all cards were on the table, as both managers tried to keep some aces up in their sleeves for the big game on Sunday. Japan cruised through the tournament at ease even when facing strong opponents. Especially their mercy-rule shortened victories over Korea and Cuba were impressive. Their lone loss came on Saturday against the USA. The United States on the other hand, had to battle a few times, but except for a 0-2 loss to Australia always prevailed. Their highlights of the tournament so far were the emotional come-from-behind victories against Cuba and Chinese Taipei. While the championship game will feature future stars in professional baseball like Yuki Matsui, Tomohiro Anraku and Ryo Watanabe for Japan or Michael Rivera, Adam Haseley or Brady Aiken for the USA, two International Baseball veterans will be in the spotlight. Japan’s catcher Tomoya Mori was named best catcher of the last 18U Baseball World Cup in 2012 and was there on the losing end in a crucial matchup against the United States during the semi-final round robin. He will meet again Bryson Brigman, who not only won last year’s tournament in Seoul, Korea, but also the 16U Baseball World Cup in Lagos de Moreno, Mexico in 2011. Both already left their mark on the XXVI edition with important hits. Prior to the Gold Medal Game two more games are scheduled on Sunday. Chinese Taipei, which had edged out Korea in the first extra innings game of the tournament, is facing Cuba in the Bronze Medal Game. In the game for fifth place Venezuela is playing against Korea. It was not an easy victory for Cuba, which overcame a 4-6 deficit with three runs in the seventh to down Venezuela 8-6 at Taichung City Stadium. The South Americans, which concluded the second round with a 0-5 record, scored four runs in the sixth to bring the record title holder to the brink of a loss. Julio Martinez capped a 3-for-5, three-run performance with a solo home run. A bases loaded walk by Li Lin in the bottom of the eleventh inning helped Chinese Taipei to a 5-4 win and into the Bronze Medal Game. A pair of RBI singles had erased a 2-4 deficit moments earlier. Both teams had scored once in the first and in the tenth, which otherwise was a close pitcher’s duel. Korea now has to settle for the game for fifth place. In the evening game on Saturday the fans in attendance at Intercontinental Stadium saw a preview of Sunday’s Gold Medal Game between Japan and USA. The defending champion prevailed 10-4 lifted by a pair of four-run innings and highlighted by back to back home runs of Adam Haseley (inside the park) and Jackson Reetz in the eighth. Jeffrey Schwartz went 5-for-5 with two runs and two RBI. Yasuhito Uchida had three RBI for Japan.